Perhaps your home needs a Wi-Fi upgrade. 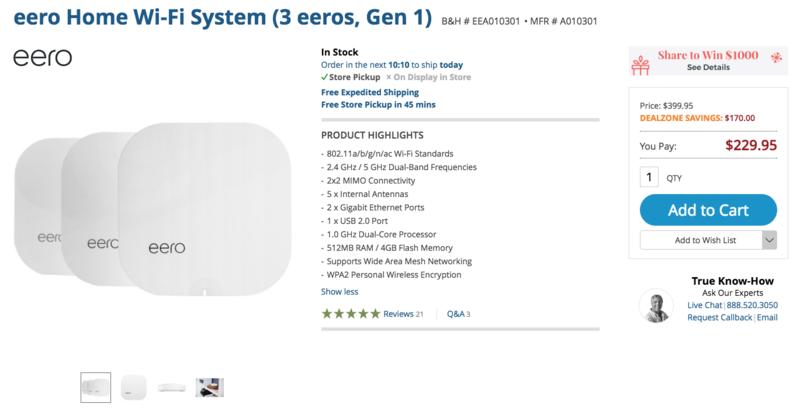 B&H is offering the first-generation eero Home Wi-Fi System at a steep discount. The second-gen bundle is better, but it also costs several hundred dollars more and doesn't represent a huge upgrade. This bundle includes three eeros. They support 802.11a/b/g/n/ac Wi-Fi, 2.4GHz and 5GHz frequencies, 2x2 MIMO connectivity. Each has five internal antennas and two gigabit Ethernet ports. This system is available for a paltry $229.95, which is a full $170 off its MSRP. Amazon pricing doesn't and has never come close to this number. Another good deal B&H has is on a 'Samsung Fast Charge Power Package.' This bundle retails for $99.99, but it's seeing a discount to just $39.99 for a limited time. It comprises a Fast Charge wireless charger, a Fast Charge power brick and USB Type-C cable, as well as a Fast Charge car charger with two USB ports, one USB Type-C cable, and one microUSB cable. Considering how $39.99 is about the price for that fast wireless charger itself, this bundle is a no-brainer if you need some Quick Charge accessories. Amazon is offering the same deal, though you will have to pay tax everywhere, whereas B&H only charges tax to those in NJ and NY. Of these deals, I'm personally partial to that Samsung Fast Charge bundle (that's a lot of value for the money) and the Joby GripTight GorillaPod Video (nobody likes watching shakycam footage). All of these discounts are valid until December 28th at 11:59pm ET, so you have some time to decide what you want. We've got more deal alerts from B&H coming, so stay tuned.